Ice cream and soft-serve yogurt, made-fresh-daily on-site, along with other delicious treats, will be served at the first Bruster's Real Ice Cream to open in Savannah. The shop is the first in Bruster's 25-year history created especially for four-season enjoyment. It also is the first to dispense soft-serve yogurt and fresh-fruit smoothies. Bruster's is known for fun. Children under 40-inches tall enjoy free Baby Cones. On the annual PJ Day, guests wearing their jammies get a free single scoop waffle cone. The new concept prototype incorporates indoor seating and "treat theater" display cases, allowing guests to see their orders being created and personalized with toppings. Its bold décor with bright red and purple walls creates a vibrant environment. 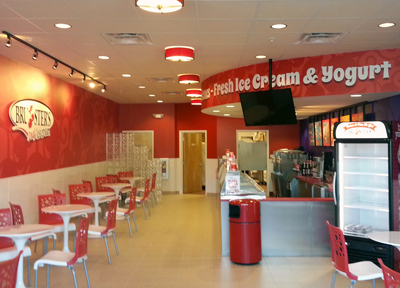 The 30-seat, 1,600 square-foot shop also introduces Bruster’s new menu. Along with at least 20 flavors of premium ice cream made in-house, the Savannah treat shop will serve sorbets, milkshakes, pies, cakes, Italian ices, fresh fruit smoothies with add-ins for power drinks and soft-serve yogurt. Opening Friday, January 17, 2014, at 1 p.m.
Like many former members of the military, Patrick DeLaRosa was looking for his next career. "Savannah was missing a traditional, family-oriented, real ice cream store," said DeLaRosa. He researched the frozen treat sector and determined Bruster's was right for Savannah. As part of its revitalization strategy, Bruster’s has revamped its business and franchise model, dramatically reducing investment and operational costs. Click here for franchise information. “Mentoring Tomorrow's Leaders, Today” serves as Bruster's foundation and business platform. At its 200 locations in 18 states and the nation of Guyana, up to 37 flavors of hand-crafted ice cream, yogurt, Italian Ice and sorbet are made fresh daily. Founded in 1989, Bruster’s is based in suburban Pittsburgh, Pa.